Thanks for the add just joined up today and have a question. I have an 01 Bullitt that I have owned for about 5 yrs and have always thought something was wrong with the front suspension but never looked into it. Car is lowered with H&R springs they are either the Sport or Super Sport I have to check the part #. I also am not sure if there are isolators installed. I have the springs, Bilstein struts, MM castor camber plates and a 2-3" wheel well gap. What could be the issue as for tires I am running 265/35/18. Rear of car sits as I feel it should but the front looks off. The issue is that your front tires are way too small. As in 2" shorter than the OE sizes, which in terms of tire to fender gap completely offsets the first inch of lowering. IOW, a set of springs that claim to lower your car by 1" would end up with the same fender gap as a Mustang on OE tires that has not been lowered at all. The nose would be lowered by 1", which would give a noticeable amount of 'rake' as long as the rear tire diameter was left stockish at about 27". 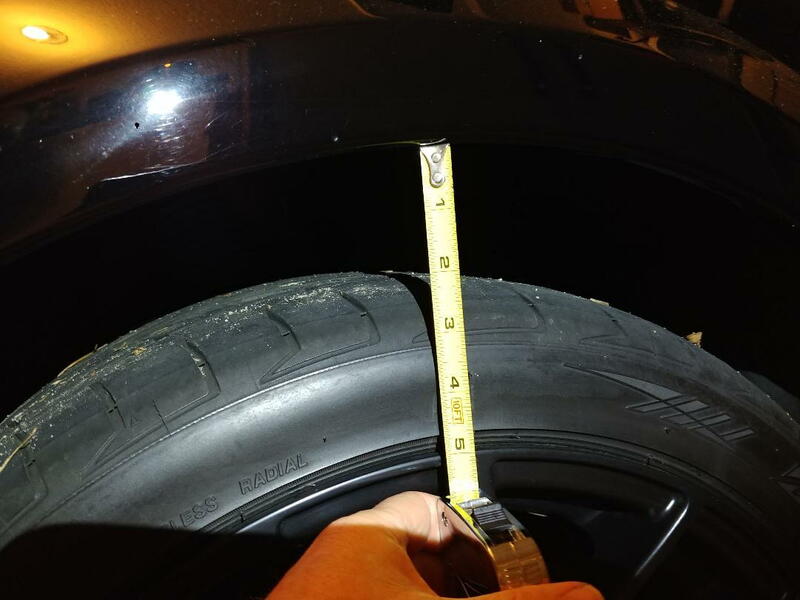 265/35-18 is too small for a Mustang in terms of load capacity - it's 4 index numbers smaller than what Ford typically installs as OE (it's a 93 SL tire vs 97 SL, SL meaning "standard load"). You may be able to "crutch" this by increasing front tire inflation pressures by 4 psi or so, which will probably trade higher than normal carcass heating using Ford's door sticker pressure for higher than normal center-tread wear. Of the two, tread wear is the less serious way to go wrong. Last edited by Norm Peterson; 01-12-2019 at 09:04 AM. Spark plug gap - use factory or modified gap setting for this setup??? Quick Reply: H&R springs 2-3" gap?